Heeding to the prayers of Lord Brahma and other deities, the dweller of Vaikunta descended upon earth as the son of Vasudeva and Devaki. He chose Dwaraka as his abode which had the essence of the architectural aesthetics and beauty of Devaloka designed by Vishwakarma. Being desirous of accepting the service of Shri Madhva, He relinquished the opulence of Dwaraka and came to Udupi. Several Rajas and Maharajas have offered gold and gem encrusted jewels to the one who surfaced at the shores of the ocean, Lord of the world, worshipped by Rugmini, bearer of the butter churner, Bala Krishna and been blessed. The spiritual preceptor and great ascetic Shri Vidyamaanya Shripadaru had offered a gold cradle, a gold chariot and a diamond crown to Shri Krishna who bestowed him with the opportunity to worship Him and received His blessings during the tenure of his two paryayas. His wish to present a diamond armour to the Lord was fulfilled during the paryaya of his disciple and he received blessedness as an in dweller of his student. The edifice, tower and sanctum of the temple are akin to the Lord’s body and protecting them from calamity is the duty of every single devotee. The lineage of those who erect these structures as prescribed by the shastras will elevate to attain Vishnuloka. A tower made of wood is four times more meritorious than an earthen tower. A brick tower is ten times more meritorious. While a stone tower is a hundred times more meritorious, a copper – silver tower awards merit that is a thousand fold. Shastra opines that a gold tower is a lakh times more meritorious than the former. During his second paryaya, the pontiff of Palimaru Matha, Shri Vidyadheesha teertha Shripaadaru is wishful of replicating the opulence of Dwaraka by adorning the tower of the sanctum with gold, invoking the stream of grace of Shri Krishna who came from Dwaraka accepting the call of Madhva and filling the hearts of devotees with joy and blessings. 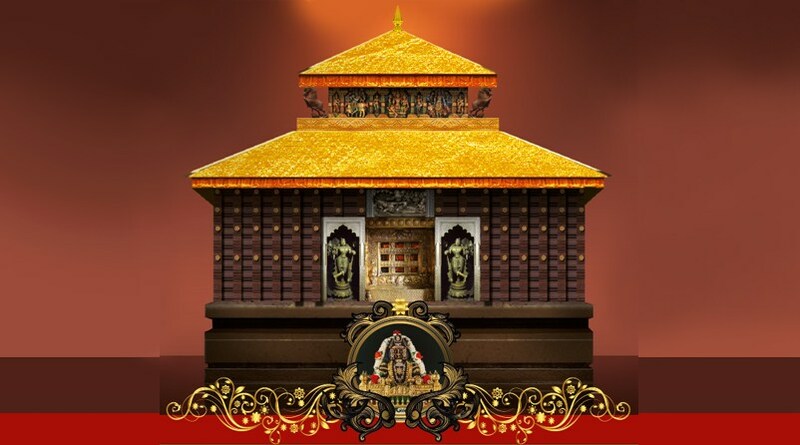 Let us manifest the charm of the golden tower of Tirumala the abode of Shri Venkatesha at the residence of Shri Krishna which is in Karavali style of architecture and make good fortune ours. With every square feet necessitating 40 gms of gold, around 2500 square feet would require 100 kgs of gold. Requiring an outlay of about 32 crore rupees, this grand endeavor can be embodied solely with the collaboration and contribution of the crores of devotees. Just as every being from the squirrel to the heroic monkeys who were part of building the bridge were blessed, may everyone from the common man to the affluent contribute as per their capacity towards this sacred project of presenting a golden tower to Shri Krishna and be entitled to His grace. We solicit contributions from the devotees of Shri Matha with whose cooperation in the past paryayas, offerings of a golden chariot – cradle, a diamond armour – crown, chinnara santarpane and several other social and spiritual programs have been brought to fruition. Besides these denominations, one may also contribute according to their capacity. Details of your contribution must be intimated to the Manager of this program.